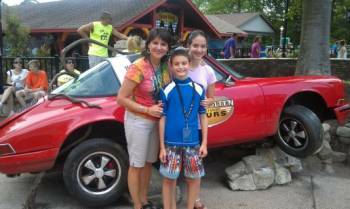 Busch Gardens Williamsburg - Here's How to Save Money! Planning a trip to Busch Gardens Williamsburg? Want to see why I call Virginia Beach Family Fun the "Top Internet Source for Busch Gardens discount ticket secrets?" Want to know why you won't catch ME on the roller coasters? Want to see a video of "Verbolten"? Want to learn money-saving tips? Scroll down to learn all these things and more to make your park visit as inexpensive and enjoyable as possible. After all, this park has been voted the world's most beautiful park almost too many times to count. Admission Facts and Deals - Current admission info plus deals like Fun Cards, Buy-One-Park-Get-Another-Park Free Deal, and the free Preschool Pass. Busch Gardens Coupon Codes to save you $15 or more! ﻿Season Pass Discounts - Tough to find, but they do exist! Military Discount - All about the "Here's to the Heroes" program. Concerts & Events - From "Ramp Jam" to "Glory in the Gardens"
Howl-O-Scream - Admission facts, deals, and discounts up to $30 off + how to get a FREE ticket! 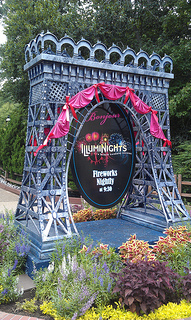 If awards are any indication, Busch Gardens Williamsburg can't be beat. It's been voted the world's "Most Beautiful Theme Park" for more than 27 consecutive years by the National Amusement Park Historical Association. Plus, it's been called the World's Best Theme Park in the Theme Park Insider Awards, and regularly gets first place for"Best Landscaping" and "Most Beautiful Park." And it's more family-friendly than Kings Dominion, which tends to draw a bigger teenage crowd and sometimes has, shall we say, elements that aren't quite so appropriate for the little ones. Click here to learn about Kings Dominion (and learn which park is right for you). For example, their Sesame Street Forest of Fun features kiddie-sized rides which are mini-versions of popular adult rides, a cool water-play area, plays, and characters walking around. Last year, the park introduced two new rides: InvadR, a wooden coaster featuring a 74-foot drop and nine airtime hills, and Battle for Eire, a virtual reality ride which the park claims to be the "first of its kind in North America." Busch Gardens/Hotel Package Deals--Good or Bad? - Considering a package deal? Here's how to be aware of timeshare scams and learn whether package deals are really "deals" or not. How to Go Straight From Rollercoasters to a Luxurious Massage.... It's my mother-in-law's review of her blissful experience at Busch Gardens' Kingsmill Resort and Spa. You can always check out the latest news at the park by going to their website here. Videos of Tempesto, Verbolten, and Griffon...Plus Why You Won't Find ME on Them! You may have heard about Verbolten, one of the park's recent rides. Set in a German tourist center, the ride mimics an autobahn tour that goes strangely awry and ends up in the scary Black Forest, where it takes an 88-foot plunge. Hamptonroads.com gave the ride a "fun scream" thumbs up, while themeparkreviews.com posted this video of the ride. Notice: The guide in the ride has NO hat or loose article. Thanks to a bad hair day, I was wearing a hat when I rode Verbolten. The park worker told me to either take it off or hold onto it. I should have taken it off: The g-forces were so great that keeping my hand on my hat kept pulling my head down so I couldn't fully enjoy the ride. Also, remember that if you have anything larger than a fanny pack or a small cross-body purse, you'll have to check it in a locker before riding Verbolten. Lockers are available just outside the ride. So WHY won't you find me on Griffon or any of the other spinning coasters at Busch Gardens Williamsburg? I would LOVE to go on the Griffon. Really, I would. But I can't. Can't do it. After going roller coaster-free for 15 years (a little problem with my inner ear means they make my dizzy as all get-out) I took a chance and hopped on a coaster at Hershey Park. Big mistake. Knew it within two seconds. I've never been so nauseated in my life. Just thinking about it makes me feel ill. But even someone like me can appreciate Busch Gardens Williamsburg, because it's so much more than just state-of-the-art roller coasters. Still, I'm working on a special Busch Gardens Williamsburg page dedicated to people like me who love the park, but can't handle the big rides. I'm thinking of calling it "Busch Gardens Williamsburg for Non-Coaster Riders." Or maybe "BGW for the Coaster-Challenged." An amusement park I CAN recommend completely (even for spin-challenged people like myself) is nearby Great Wolf Lodge Williamsburg, our family's new favorite vacation spot. Click here to read my full review, photos, and videos of this fantastic (and surprisingly affordable) indoor waterpark resort!